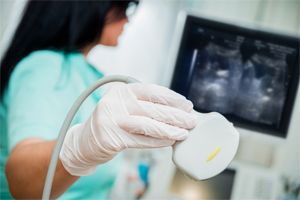 Ultrasound imaging exposes parts of the body to high-frequency sound waves to produce pictures of the inside of the body. Because ultrasound images are captured in real-time, they can show the structure and movement of the body’s internal organs, as well as blood flowing through blood vessels. Ultrasound exams do not use ionizing radiation (x-ray) and is usually a painless medical test that helps physicians diagnose and treat medical conditions. Ultrasound examinations help diagnose an assortment of conditions and to evaluate organ damage following illness. Ultrasound can assist physicians with diagnosing symptoms such as acute pain, swelling, tenderness or infection.